SAT Online Prep Classes Available! We are available for drives every day of the week, including weekends & evenings. Our office hours are 8 AM to 4 PM on days that we have a classroom in session. 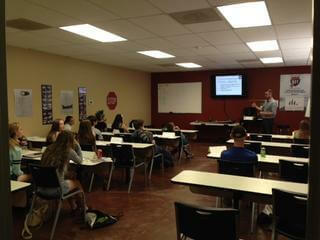 What makes 911 Driving School different?ALL of our instructors are police officers and firefighters. Experience, Knowledge and Trust are what they bring to our school. The officers and firefighters knowledge and experience will prepare your student for the great responsibility that comes with obtaining a driver’s license. We offer a small class size experience, and ONLY do 1 on 1 behind the wheel drives. Take a tour of the school here. THANK YOU FOR YOUR BUSINESS! As we begin our 10th year of business we want to thank our customers for their loyal support. 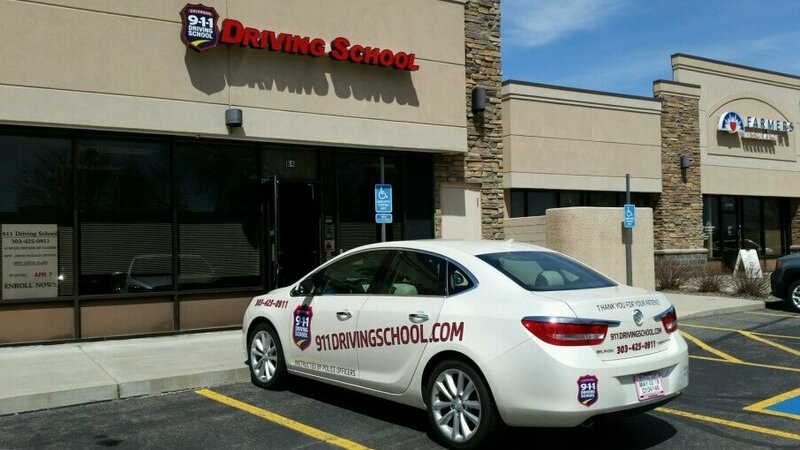 When we opened we were the only Colorado driving school to exclusively use Police Officers and Firefighters as instructors. Since that time there are other Colorado driving school doing the same so we are proud to have started this important movement. Attend the required 30 hour driver’s education course. Classes are offered in 4 sessions, and takes 2 weekends or 4 days straight depending on class. 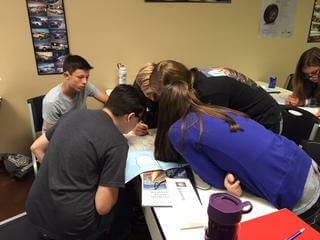 The written permit test is administered at the end of final class for students that are 14 years and 11 months or older. Class schedules are listed below. You must be at least 14 years and 6 months old to attend. During the year you hold the instruction permit, complete the required 6 hours of behind-the-wheel training with an instructor. Also complete the required 50 hours of logged driving time with a parent. Take the driver’s license road test for an additional $50 or book a couple of months ahead of time at the DMV after holding your permit for one year. Add the Drive Fit Defensive Skills Day for a total package of $659. A 3 hour course designed for new drivers who's confidence and skill level are not synced together. This training is held on a closed course and concentrates on parking, reversing, lane changes, turning/curving, emergency braking and slalom/vision. Students must have a valid permit or license and a guardian in the vehicle (if the teen is unlicensed). Students use their own car. 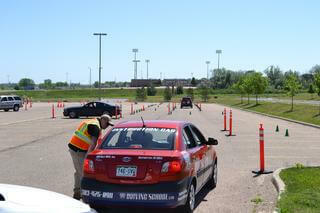 Check with your insurance agent to see about teen driving discounts for taking this course! Class takes 2 weekends or 4 days straight. Date listed is first date of class. Minors who wish to get their Colorado Driver's License prior to age 16 1/2 must have the 6 hours BTW with a certified Instructor, which are not included with this package. Drive appointments must be paid in advance when scheduling. Class takes 2 weekends or 4 days straight. Date listed is first date of class. Evaluation Drive and License Test It is 911 Driving School policy, that if you have never held a license, you must complete a 1 hour evaluation drive with an instructor and be approved to test for your license. Evaluation drive is done using our vehicle, and if vehicle is available the test can be done in our vehicle as well. This package takes care of both the drive and the test. Once we receive your registration, we will call you to schedule! You must have a CO Instruction Permit. Online Teen Driving Course & SAT Prep Course Available! Our New Driver online product is available! You won’t find any other programs that compares with our Colorado Online Driver’s Education course. Convenient and 100 percent online, the class is state-approved and will satisfy state requirements for the 30 hour driver’s education class. There are a variety of packages to fit your needs. A LINK, USER NAME and PASSWORD will be sent to you after we receive your student’s registration. If you register outside of business hours (9 am – 4 pm), the information will be sent the next business day. Once your student has completed the 30 hour online class, we will receive notice of completion. Students must be 14 1/2 years or older at completion time. We will provide the state certificate of completion, and once the student is 14 and 11 months or older, they may take the written permit test in our office. A visit to the DMV is still required to obtain the actual permit. Remember, teens who wish to get their CO Driver’s License prior to age 16 1./2 must have 6 hours behind the wheel completed with a certified instructor. Our regular discounts are only applicable on packages $499 to $659. You can pay in full online and we will issue you a refund for the special. Please contact our office at 303-425-0911 or send a email to us at Westminster@911drivingschool.com to let us know your students name and what special you are using so we can refund accordingly. You are also welcome to call our office and register over the phone to receive the discount without having to issue a refund. Perfect to see if you are ready to take your Driver's License Road Test. Required before taking driving test for anyone not previously licensed in Colorado. To advance to this package adults must successfully complete 1 hour of evaluation to demonstrate basic skills necessary to safely drive on public roadways. Adults learning to drive usually need more hours of instruction. Save $'s by choosing this larger package.